Flexi-Glass Enamels – David discovered that only these enamels had a special “stringy quality” when mixed with 1/2 tsp - FGEnamel and 1 tsp - FG Medium. The strings are dribbled over the FG Transfer Sheet. Dry in a pre-heated kiln at 175ºF or 80 C for 25 – 30 minutes then pealed off the FG Transfer Sheet and applied to fused projects to create intense colored lines. These are a fine powdered Mica that is used to make flexible FG Luster Sheets that can be cut with punches or scissors. Just mixed 1 tsp – FG Mica and 1 tsp - FG Medium. Paint the mixture onto a FG Transfer Sheet then dry in a pre-heated kiln at 175ºF or 80C for 40 minutes. Adding half glass powder to half mica will make a sheet that can be fired on top of glass as well as in between layers of glass. If some areas do not easily peel away from the transfer sheet, coat with a light layer of Flexi-Glass Medium and re-fire. 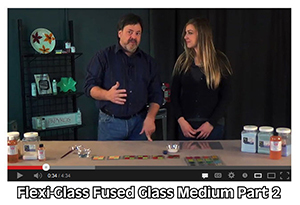 Flexi-Glass Transfer Sheets Reusable silicone mat for Flexi Glass.